Scholars at Orange Grove Middle School in Hacienda Heights got a snow day today, even though we might reach record temperatures. Principal Alejandro Rojas reported the snow day is a reward for students who have a 2.80 GPA or higher. “We have a company coming out to build a 100 ft sled run for the students. It should be fun,” Rojas said. John Huang looks at the world with an artist’s eye. He sees shapes and colors that the rest of us normally miss. Then he faithfully reproduces his vision via the artist’s palette, giving us a slightly altered impression of reality that makes the viewer stop and think about the world around them. It’s all even more impressive that Huang is a 9-year-old student in the fourth grade at Shelyn Elementary School in Rowland Heights. 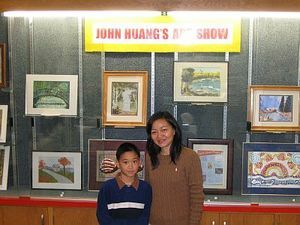 And the young artist is sharing his vision with the rest of the community via a display of his artwork at the Rowland Heights Public Library at 1850 Nogales St. It will remain through mid-February. Read the complete story in the Rowland Heights Highlander. A musical storytime will be held every Thursday in the Hacienda Heights Library. The free activity will be from 3:30 p.m. to 4:30 p.m. Kids will be introduced to singing and choral music, as well as some music theory, ear training, rhythmic exercises, and vocal exercises. There will also be an art activity. The library is at 16010 La Monde St. For more information, call Kathia Ibacache at (626) 968-0356. Low-income families from Palm and Kwis elementary schools in Hacienda Heights can receive a helping hand this Saturday, Jan. 31, at the Palm campus at 14740 E. Palm Ave. The event is called FIESTA, Family Incentives Equals Students Taking Action. Families are asked to help their children reach a 98 percent attendance record for the school year. Sponsored by Los Angeles County Supervisor Don Knabe, the event is coordinated by New Horizons Caregivers Group and its Executive Director Cathy Jamieson. More than 50,000 pounds of grocery products will be distributed, with each family receiving about $250 worth of groceries. The families qualify by having children on the Title I free breakfast and lunch programs. More than 100 volunteers will assist in the distribution.Contributors include Heart of Compass Distribution, Kiwanis Club of La Puente Industry, Latin American Bible Institute, Hacienda La Puente Unified School District and its adult education campuses. For more information about the nonprofit New Horizons Caregiver Group, visit www.nhcg.org. 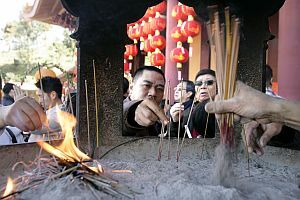 Thousands attended the Chinese New Year’s services at the Hsi Lai Temple in Hacienda Heights on Jan. 26. See our story and photo gallery of the gala event in the Rowland Heights Highlander. State Senator Bob Huff (R-Diamond Bar) announces the availability of applications for the 2009-10 California Senate Fellows program. The program provides college graduates the opportunity to become full-time Senate staff members at the State Capitol in Sacramento for 11 months beginning in October 2009. Fellows are assigned to the committee staff of a senator and also participate in seminars with officials. The fellowship program is operated jointly by the California State Senate and the Center for California Studies at Cal State Sacramento. A five week orientation at the beginning of the program provides background and training. Fellows are paid a stipend and given health care. They also earn 12 units of graduate credit for the academic portion of the program. An applicant must be at least 20 years of age and a graduate of a four-year college or university by Sept. 1. Applications may be requested from Senator Huff’s district office in Glendora by calling (626) 914-5046 or the program office at (916) 278-7693. The deadline is Feb. 25. Eighteen Fellows will be selected in May. Hacienda La Puente Adult School offers a free Tai Chi class at its Dibble Campus, 1600 Pontenova Ave., Hacienda Heights. The class runs from 7 to 9 a.m. Monday through Friday. For information, call (626) 933-8303. The Hsi Lai Temple in Hacienda Heights will host the annual Chinese New Year’s services. Thousands are expected to attend, so shuttle services have been set up to carry people to the temple at 3456 S. Glenmark Drive. Just look for the signs on Hacienda Boulevard. On Sunday, Jan. 25, a New Year’s Eve Dharma Service will be held at 7:30 p.m. The Festival of Light and Peace runs Monday through Feb. 9. Rowland Recreation Department will offer classes in karate, Chinese martial arts and ice skating. Registration is under way for all classes, which start the week of Jan. 26. The karate and Chinese martial arts classes both run for eight weeks. All ice skating courses are six weeks long. Ice skating classes are open to children and adults. Hacienda Heights Little League is accepting 2009 season sign-ups from 8:30 a.m. to 12:30 p.m. Saturday, Jan. 24 and 31, at Hacienda Heights Baseball Complex, 16949 E. Wedgeworth Drive in Hacienda Heights. Tryouts are scheduled for Saturday, Jan. 31. For information, call Robert Hernandez at (626) 336-5460 or visit www.eteamz.com/hhlittleleague.